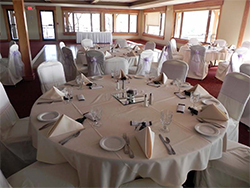 Enjoy a picturesque view from the banquet facilities that overlook the beautiful 18-hole golf course. Exquisite cuisine will be prepared to perfection by the professional staff who are experienced at hosting a variety of events including Wedding Receptions, Rehearsal Dinners, Golf Outings, Las Quinceaneras, Luncheons & Dinner Events, Birthday & Anniversary Parties, Corporate Meetings & Workshops, Bridal or Baby Showers and Holiday Parties. There is no request too big or too small.